OK I have not tried this out yet but this could be of interest. ATLAS (Automatic Tool for Local Assembly Structures) is a comprehensive multi-omics data analysis pipeline that is massively parallel and scalable. 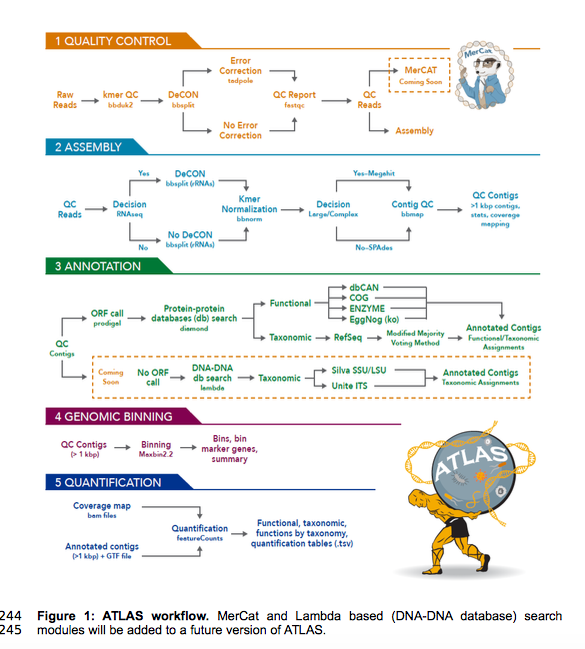 ATLAS contains a modular analysis pipeline for assembly, annotation, quantification and genome binning of metagenomics and metatranscriptomics data and a framework for reference metaproteomic database construction. ATLAS transforms raw sequence data into functional and taxonomic data at the microbial population level and provides genome-centric resolution through genome binning. ATLAS provides robust taxonomy based on majority voting of protein-coding open reading frames (ORFs) rolled-up at the contig level using modified lowest common ancestor (LCA) analysis. ATLAS is user-friendly, easy install through bioconda maintained as open-source on GitHub, and is implemented in Snakemake for modular customizable workflows.